Degustabox October Plus HUGE Discount code! With the cold weather firmly here, I was so happy to see that the October Degustabox contained lots of warming, comforting food options. As usual, I’ve been testing them out over the last couple weeks and I’m ready to tell you all what I think of this months box. Starting with my two favourites from the box. The first being the JimJams 83% Less Sugar Milk Chocolate Spread (£2.59) which is the most delicious chocolate spread I’ve ever tasted. In my house, we’ve been enjoying this on crumpets, toast and even in porridge! It is kinder on teeth with having less sugar in it, plus its gluten free and diabetic friendly which my husband’s aunty will be very pleased to hear I’m sure! The other favourite from the box is actual my husbands favourite, the Hershey’s Cookies ‘n’ Creme chocolate bar (£1). I’d love to be able to tell you what this tastes like but I didn’t get a look in; he ate it before I even took these photos which is why the packaging is looking a little flat and lifeless in the photo above. He assures me that it was incredible though and far nicer than a lot of American chocolate he’s tried in the past. Inside, the chocolate is packed full of cookie pieces which he said added a great texture to the creamy chocolate. I guess we’ll have to take his word for it! As you can see, there’s plenty of variety in the box this month with a great mix of ready prepared, cook from scratch and snacking options. I always love getting out the snacks from the boxes to enjoy when we have movie nights at home. This month, we were trying out the Beloved Date Fruit Hearts (75p each) which come in four different varieties from cocoa to berry (2 packs per Degustabox customer). They’re made from 100% date fruit with a hint of natural flavouring. They’re cold-pressed which enables them to retain all of the benefits of the whole fruit. I love how well they’re presented as inside each pack are five heart shapes! They work as a natural energy boost, are gluten free and suitable for vegans. I didn’t know whether I would like these but they really pleasantly surprised me. They’re 1 of my 5 a day yet the taste like a naught treat! I’ve been snacking on a couple when I want a sweet fix and also breaking them up to enjoy on top of porridge on a morning. Speaking of mornings, we’ve been really treating ourselves in our house with the Pitch Choco Bar (£14.0) mini chocolate filled brioche bars. They are from the brand Brioche Pasquier who are a brand that I have tried many items from in the past. Remember my macaron party in this post? These are individually wrapped which makes them great for breakfasts on the go as well as a tasty treat for elevenses with a cuppa. My hubby likes to eat his cold but I pop mine in the microwave for 20 seconds to melt the chocolate… mmm yummy! 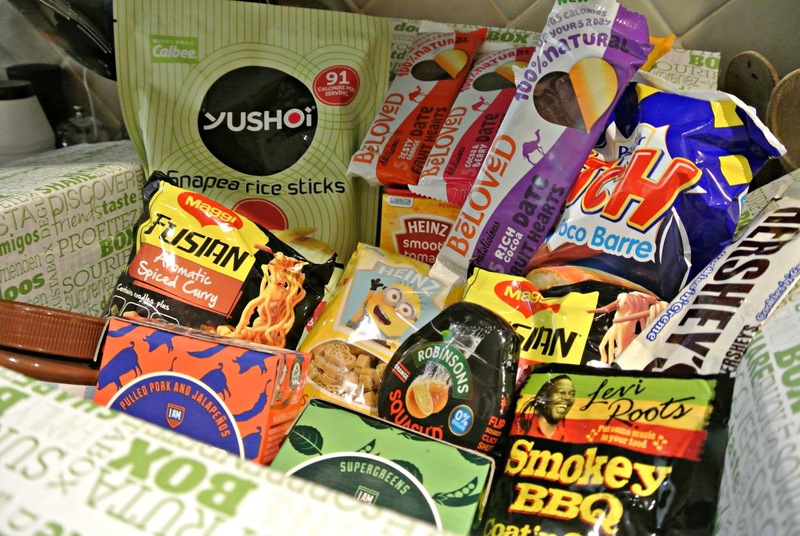 The snack that I didn’t enjoy from the box this month was the Yushoi Snapea Rice Sticks (£1.99) in the lightly salted flavour. I’ve tried something similar to these before but from a different brand so I had a funny feeling that they wouldn’t be to my taste. I’m not sure if its the texture or the taste, or perhaps a combination of the two but these just aren’t for me and my husband and dad didn’t enjoy them either. They’re basically rice sticks made from green peas that are baked which is a very good idea and I’m sure so many people will love these, especially because they’re better for you but they aren’t to our taste. These are a great snack option for vegans, veggies and those who have nut allergies as they’re nut free. You can follow Yushoi Snacks on Facebook, Twitter and Instagram. 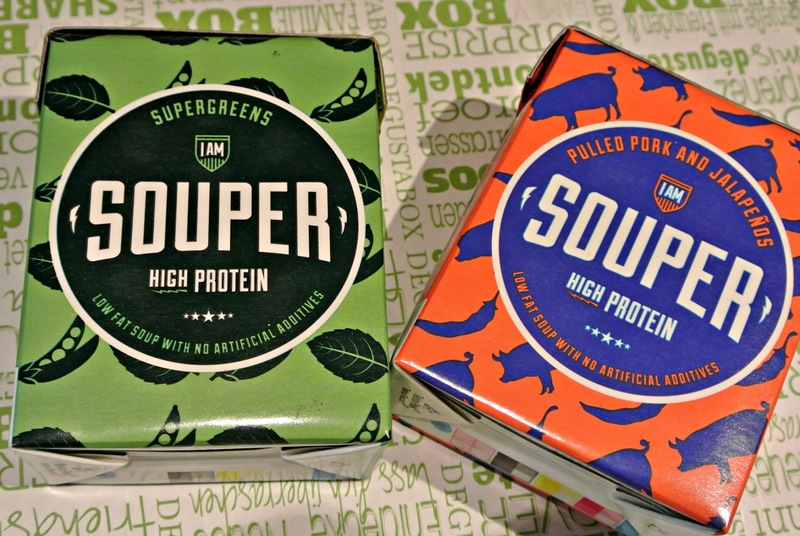 I’ve really been focusing on upping my protein over the last few weeks so I was really pleased to see the IAM Souper cartons of soup (£1.49, 1 received per Deugstabox). They’re packed full of chunky, tasty ingredients and really fill you up. I think thats partly because of the texture but also because they have a high protein count which keeps you feeling fuller for longer. They’re low in fat and have no artificial flavours or preservatives. I received the pulled pork and jalapeño flavour and the super greens flavour, the latter of which was actually my favourite. Both were very warming, perfect for cold autumn days and were quick to heat up which is great for lunchtime on days when I’m so busy. Degustabox also included a recipe card with details of how to make a Cream of Mushroom and a Butternut Squash Soup with Chilli and Crème Fraîche which is great for those who love to make their own soups from scratch. 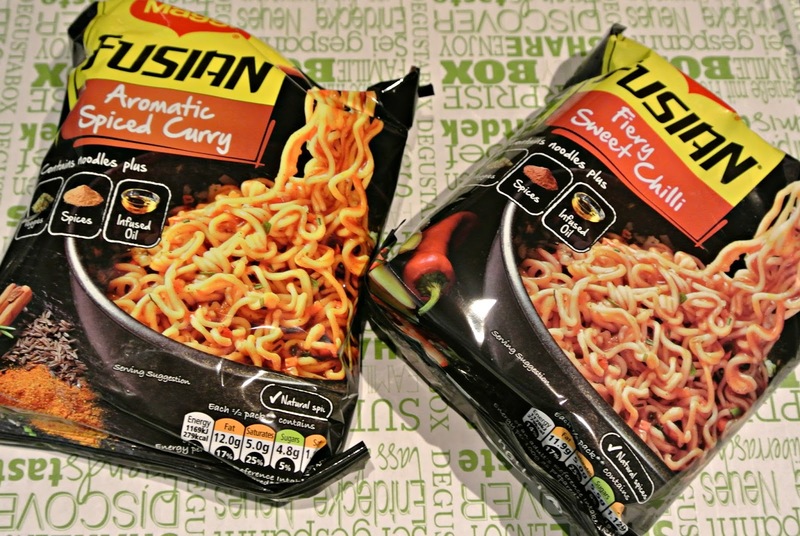 My dads favourite from the box has to be the new Maggi Fusian Noodles (2 x £1.39). These are authentically spiced, Asian style noodles, infused with oil and veggies. I made the fiery sweet chilli flavour for lunch and shared them with him and a few days later, I went back to try the aromatic spiced curry ones and he’d already eaten them! We both agree that they don’t taste like normal noodles; they’re a lot tastier and don’t taste as artificial. I enjoyed the sweet chilli ones with some chicken and broccoli on the side as I don’t think I could just eat the noodles on their own whereas my dad really enjoyed having his as a snack when it was too late for lunch but too early for dinner. We’ve been using Maggi products in our house for years, especially the So Juicy and So Tender ranges which really add a fantastic flavour to chicken and have encouraged us to try different meals and flavour combinations than we would have made before. 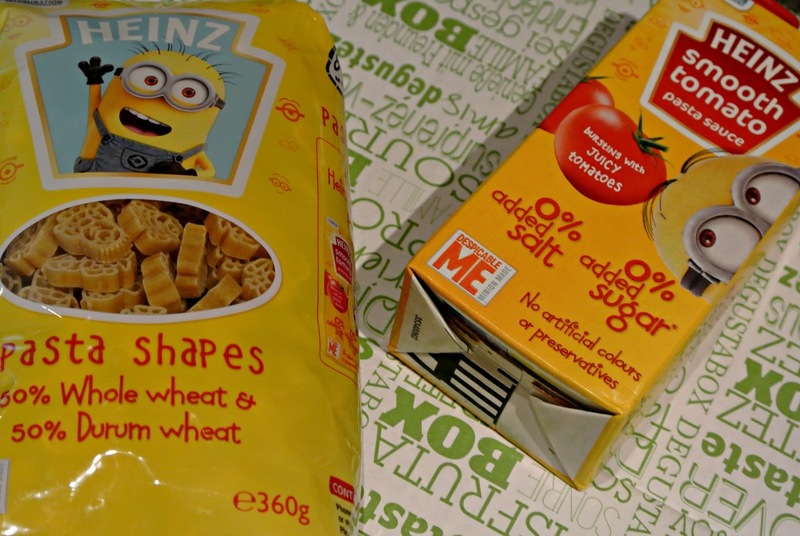 A really cute addition to this months box was the Heinz Kid’s Dry Pasta Shapes and the Heinz Kid’s Pasta Sauce. These were Minions themed and a really youthful throwback to my younger days when I used to have fun shaped pasta. These ones are made with 50% whole wheat and the tomato sauce is made without any added sugar or salt, artificial colours or preservatives. These aren’t products that I would buy myself as I don’t have children and prefer to make my own pasta sauces but if I did have children then I would certainly consider repurchasing them. If you have a fussy eater in your family, then this duo are a great way to tempt them to try something new… no bananas in sight! 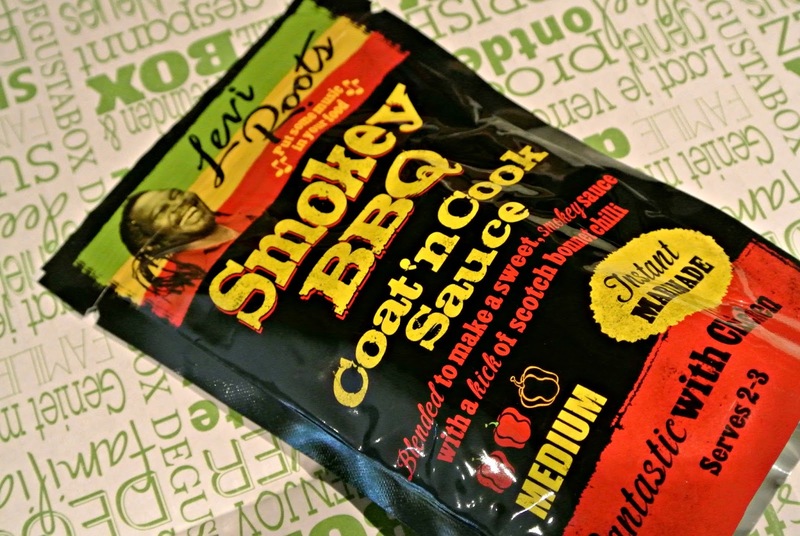 One of my favourite products from the whole box was the Levi Roots Smokey BBQ Coat ‘n’ Cook which is like a marinade that you don’t have to actually marinade! I made mine with chicken and all that I had to do was put the chicken breasts in an oven dish, pour the sauce over the top and whack them straight in the oven. I actually popped some peppers and baby plum tomatoes in half way through cooking too which made cooking really easy as I didn’t have to stand over it and then I served it with rice. We all thoroughly enjoyed the dish and thought that it was just the right mix of sweet and spicy. This sauce can also be used with ribs or fish but I’m not as confident cooking those, aside from salmon. I’ll certainly buy more of these again to use with chicken and try out the other flavours, Jerk and Ginger Beer too. They’re available in Waitrose, ASDA and Sainsbury’s. There was far less of a focus on drinks in this box, unlike in previous boxes that I’ve had, with only one food item in the box; Robinsons Squash’d. This is a super concentrated fruit squash that you can take out and about with you to add flavouring to your water which certainly makes drinking water a little more flavourful. I’m always on the go and I drink A LOT of water so having this orange flavoured squash has been a welcome change for me. At only 3 calories per 250ml serving, it isn’t going to pile on the pounds or rot your teeth and with 6 refreshing flavours to choose from, there’s a Squash’d for everyone! I would definitely buy this again as its handbag friendly and at £2.49 it is far cheaper than buying orange juice when out and about. This months Degustabox is available for only £12.99 with free shipping (PLUS there’s a discount code below! ), which I think is such a great deal for so many new food items. There isn’t a fixed contract, so you can cancel at any time. With Christmas coming up, I think that it would be the perfect opportunity to gift Degustabox to any of your foodie friends or family. There’s the option of boxes for 1, 3 or 6 months to suit your needs and budget. If you’re ordering Degustabox for the first time, enter the code 88AHT and you’ll get it for ONLY £5.99; saving you £7 off your first box! These always look like such great boxes, I love the fact they contain things that you could so easily add to your shopping list without breaking the budget. I know I say it every time but Oh I want to try degusta box! I really ought to order a subscription! The Asian noodle dishes look especially tasty to me. It's funny because someone was JUST telling me about this subscription box today! I like spicy noodles. I am going to look for the fiery sweet chili flavor. I love snap pea snacks so I am going to try the Yushoi brand. I think this is a really good value box with plenty of variety. I really want to subscribe to this box! Minion-shaped pasta?! Yes please!! My goodness how much food have they stuffed into that box it's brilliant. I'm not sure about the Asian noodles though, I'd probably bin those. 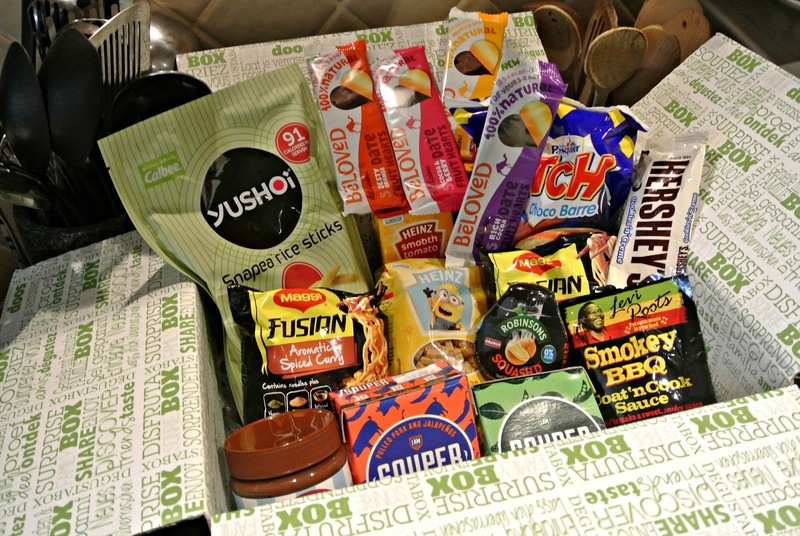 This looks like such a fun foodie box full of lots of variety. What I love about these boxes is that they are full with things you wouldn't necessarily pick up from the shop yourself! Hershey's Cookies & Cream chocolate is amazing. So glad that it's in the box! I've been meaning to try these boxes for ages! Particularly like the look of the minions pasta, how fun! The Beloved Date Fruit Hearts are super cute! This looks like a great box this month! There is such a varied selection in the box, its perfect as there is something for everyone. I'm so tempted by this subscription box – there are some really cool products.